I can’t believe 2017 is already here! Are you ready for it? Is your fundraising ready for it? 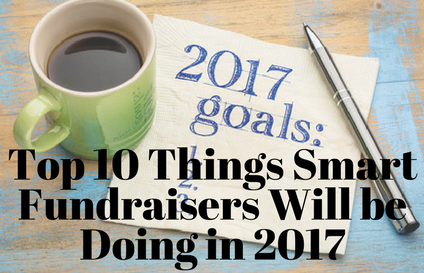 How will you be increasing fundraising revenue AND strengthening donor relationships in 2017? Embrace transparency. When your donors are treated like the valuable partners for change they are, this includes being upfront with them about your challenges and your triumphs — in equal measure. Take a cue from Watsi and their brilliantly transparent annual report. Lead with gratitude. Make gratitude a daily habit. Did you know it takes just 28 days to make a habit? We all have it in us to engage in a little daily positivity, especially in a pursuit for successful fundraising and better donor relationships. Make it a point to spend 15-30 minutes on the phone every morning, solely for the purpose of communicating your gratitude to your donors. That’s it: call just to say thank you. Master the tenets of donor-centricity. Know that you’ll achieve your full fundraising potential once you recognize that your donors absolutely share your goal of wanting to create a positive difference in the world — and understand that your job is not to educate, but to delight and inspire. I recently became involved in a conversation discussing over-solicitation. And yes, for years we’ve been hearing the claim, “Over-soliciting and insisting on unrestricted gifts are largely why 65% of donors who make a first gift never make a second and why 90% or more donors who start giving are gone within five subsequent appeals.” Time and time again, my members are pointing to increased donor communications as a primary reason for their fundraising success. I think this is another one of those blanket “direct mail doesn’t work” or “email is dead” arguments. It’s not over-solicitation. It’s poor solicitation. Whether it’s a matter of lousy direct mail or inspiring email, it’ll most likely lead to the same results: lousy fundraising. Start small with a heaping dose of donor love. Focus on employee retention. With all of the sector’s talk about donor retention, have we been ignoring a critical component (employee retention)? How on earth can we expect nonprofits to create lasting donor relationships when employee attrition is so high? Look for an upcoming White Paper to shed light on what your organization should be doing. Self-care. You’re not a saint. How can you reasonably expect to do the critical work of saving the world if you’re not taking care of yourself? Take a cue from Beth Kanter and Aliza Sherman. The Happy, Healthy Nonprofit is a manifesto for a culture shift in the nonprofit sector, starting conversations about the importance of individual self-care and WE-care in the workplace. Invest in the Basics. Nonprofits are investing in the training needed to create their diversified fundraising program. And smart nonprofits are investing in Basics & More training, the only courses that encourage you to enroll your entire team. In addition to classes on monthly giving, planned giving, direct mail fundraising, board fundraising, major gift fundraising, stewardship and more, in 2017, we’ll be adding training covering Google analytics and mobile fundraising. We know what’s going on in the fundraising world, and we keep up. Every step of the way. Know your data. How many prospective donors arrive at your donate page with the intent to make a gift…only to leave without doing so? When Aaron Fogelman of Britany’s Hope did the work of tracking his website visitors, the result led him to making the changes necessary to increase the organization’s online fundraising from $11,000 a year to over $160,000 a year! What’s your donor retention rate? Keep the metrics that count front and center. Begin every board meeting with a dashboard review. What else is good? My 2017 Fundraising & Marketing calendar should start you off on the right foot. It’s jam-packed with useful tips, ideas that you can integrate into your work, and important events that you won’t want to miss. Plus, it will get you super pumped for each and every Basics & More™ course. Whether you want to sign up for the courses individually throughout the year, or you’ve already made the smart choice and taken advantage of my All Access Ticket, you’ll be reminded each month of which courses begin when, and with 20+ courses, that’s some help you could use. And it’s never looked so good, so special thanks to my graphic designer, Ruth, for helping to make this year’s calendar a reality. My team and I have worked tirelessly to ensure that this year’s calendar topped the last one. Inside you’ll find monthly reminders of what smart fundraisers are focusing on, “attitude of gratitude” tips from readers (are you inside?) and more! Dive into 2017 right, and download your 2017 Fundraising and Marketing Calendar now!